Writer/director Paul Czinner, who in 1936 adapted Shakespeare's As You Like It to the screen, was the guiding force behind the 1966 feature Romeo and Juliet. Unlike Czinner's earlier Shakespeare film, however, not a word of the Bard's text is spoken in the 1966 production. 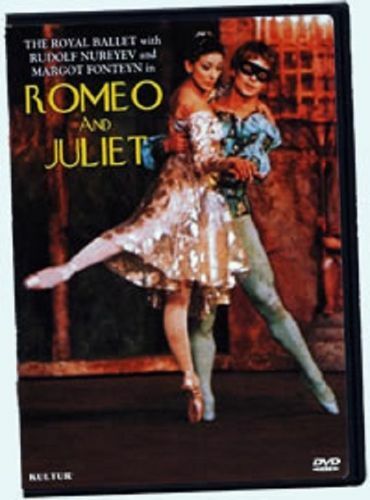 Rather, this is a filmed record of a performance of Prokofiev's ballet version of Romeo and Juliet, as originally presented at the Royal Opera House. The stars are the matchless Rudolf Nureyev and Margot Fonteyn, who brilliantly overcome the disappointingly bland choreography of Kenneth McMillan. For the benefit of non-ballet aficionados, each of the production's three acts is introduced by a spoken synopsis. Others in the corps de ballet include David Blair as Mercutio, Desmond Doyle as Tybalt, Gerd Larsen as Nurse and Ronald Hynd as Friar Lawrence.